Andrew Hill holds a Bachelors of Music in Music Education/Trombone Performance from San José State University. While at San Jose Staté, he studied trombone with Tom Hornig, Kyle Covington, Timothy Owner and members of the San Francisco Symphony. He has studied conducting with Dr. Edward Harris, Dr. Peter Boonshaft, Dr. Bob Halseth, Dr. Mark Scatterday and Dr. Rodney Dorsey. 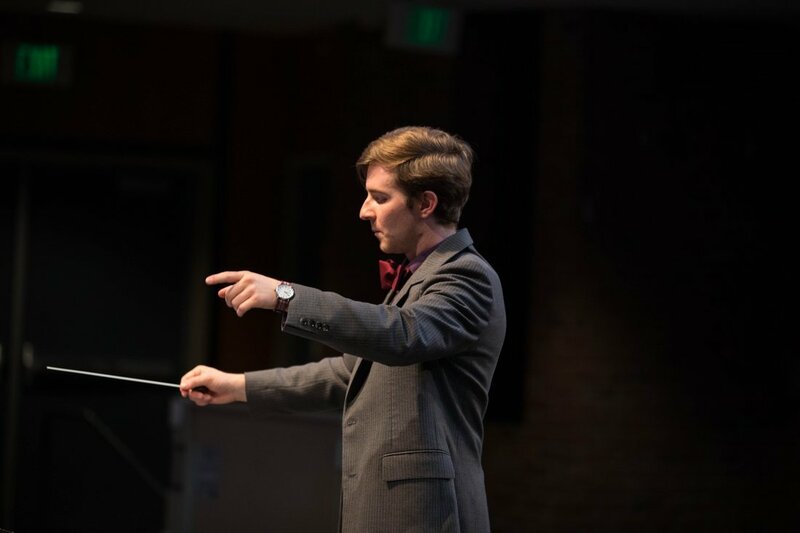 Prior to moving to the Bay Area, Andrew grew up in the mountains of Lake Tahoe, California where he was inspired to pursue music through his music director, Dean Nordby and studied bass trombone with Donald Glattly. He has performed with numerous world-renowned professionals including Grammy Nominated trombonist Wayne Wallace, Grammy award-winning composer and LA studio musician Gordon Goodwin, Juilliard Professor of Cello Bonnie Hampton and Grammy award-winning saxophonist and composer Dr. Aaron Lington. Andrew was the bass trombonist for the San Francisco Symphony Youth Orchestra from 2012-2015 and performed on the orchestra's 10th International European tour. In addition, the San Francisco Symphony Youth Orchestra's performance of Gustav Mahler's "Symphony No. 5" in May 2015 won best orchestral performance from the San Francisco Classical Voice's readers poll in 2015. Currently, he is an active freelance trombonist in the Bay Area for various genres of music. As a music instructor, Andrew has been the Trombone Instructor at Donner Mine Music Camp from 2011 - 2014, Activities Director at Donner Mine Music Camp 2015 - 2018, was the Director/Trombone Instructor for the San José State University Young Musicians' Project 2013-2015, taught elementary band at Booksin Elementary School in San José through Arts Initiatives from 2015-2017, was a Music Instructor for San José Jazz Progressions 2015-2017, was the Elementary Brass Instructor in the Saratoga Union School District for the Fall of 2017 and taught in the Los Altos School District instructing brass, general music and band for all seven elementary schools in 2018. Additionally, he helped establish the Community Arts Programs for the Vanguard Music and Performing Arts from 2015-2018. Currently, he is the Music Director at Los Gatos High School and the Operations Manager at Donner Mine Music Camp. As part of his teaching, he focuses on beautiful sound production, increasing technical range and facility, critical work on sight-reading and making beautiful music.